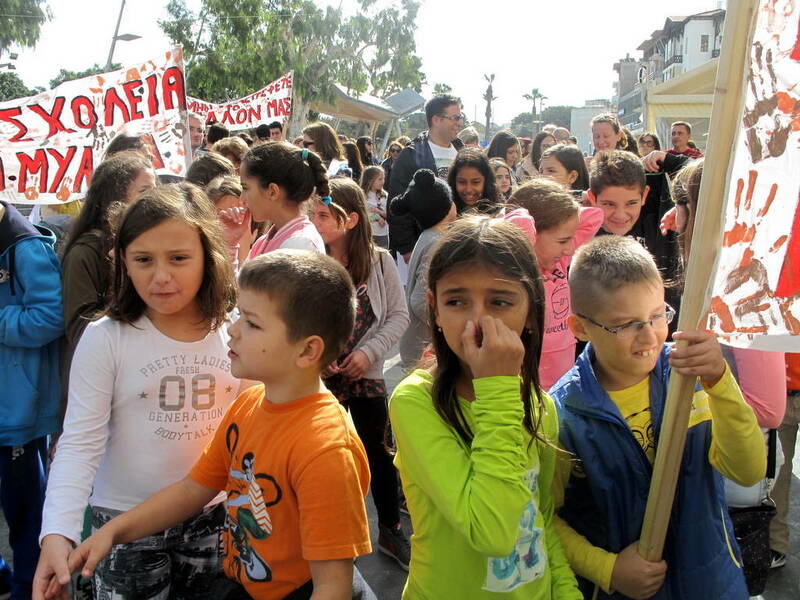 Today I once again marched with students, parents, and teachers of the School of European Education Heraklion, which is again under threat. I took the posters that my dear friend Aglaia Michelakis-Kamprani made with her students in 2014. Many other old colleagues, friends, students, and parents were there. Many more were there in spirit, I’m sure. Why did I march? A couple of months ago I reluctantly decided, for various reasons, not to teach at the school this year, and I have withdrawn my own children from the school, at least temporarily. So why am I still campaigning for it? First, of course, for the sake of the students and staff. There are students at the school who have spent their whole school life in the European School system and who have no Greek. How could they join the Greek school system if the SEEH were to close? We owe it to them to allow them to continue their education. The staff—both those already hired and those still waiting—deserve our support, They know how vital the school is and are making great personal sacrifices for it. For example, my good friend Margarita Makrakis is currently self-funding her studies in educational support so that she can provide more effective help to her students. Yet she still doesn’t know if she will be hired this year. How is that for staff commitment? How can we not support such people? I am proud to stand with them. But more than that, I marched because I still believe in the school and its European mission. There is more to a school than its present. A school is a community. Some of us were there in the past, some of us are there now, some of us are hoping to be there, but we all care for the school and carry it in our hearts, and we all believe in the European ideals set out by Jean Monnet. I know the school has big problems, and students, parents, staff are not happy. But we should respond by trying to solve the problems, not by pulling the plug. We must fight to get the right support, so that the school can function as it should. We must do this, not only for the students who are dependent on it, but for all the children and families who could benefit from it in the future. And we must do it for ourselves—we have created a wonderful community spirit over the years, and we must preserve it. I firmly believe that, if it’s to survive, the school must expand. There are many students and parents who have asked to join our community but been refused. We must let them in, for their sake and ours. With a larger intake, our case for bigger premises and more staff would be far stronger. And by expanding our community we would expand the good will towards us. When people see what we are doing and what effects we have on students’ lives, they realize how special this school is and support our cause. Have we a hope? Yes. I’m sure there are people who can see what this school really is and what it can be, and who have the power and courage to do something about it. If the right person hears us, there is every chance of success. We owe it to our amazing students—past, current, and future. We owe it to the colleagues who are still waiting to be hired. We owe it to the town, to Crete, to Greece, and—yes, I’ll say it—to Europe. And we owe to it our school community. Today’s march is over, but the fight is not over. Please, join us.